The following information will provide an overview of the emergency procedures in effect at Dreamland Resort and a guide to the location of medical facilities available in this area. Police services in this area are provided by the Ontario Provincial Police (OPP) and the Hastings Village Fire Department. Scroll down this page for detailed information on the following topics. A land-line emergency telephone is available 24/7 outside the entrance to the office. If you are calling 911 from a land-line telephone in your unit or the emergency phone at the office, the 911 operator will see the location noted below on their screens. They will require your site number. The following procedure has been designed to alert the park staff, residents, and guests of an emergency situation. Using an emergency air horn or a car horn, sound three 1-2 second blasts on the horn within a 10 second time frame. Repeat this signal until help arrives. In an emergency, you can also use your key fob to remotely activate your car horn or car alarm. a) Park staff and/or park residents should come to your location to assist. b) If 911 has not yet been called, ask one of the first responders to make the call. 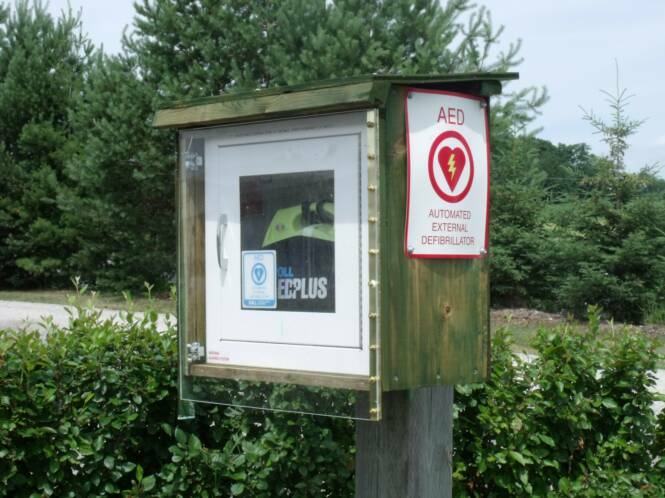 c) If it appears that the Automated External Defibrillator (AED) may be required for the emergency, one of the first people to arrive should retrieve the AED from the cabinet at the corner of Dreamland Drive and Angela’s Drive. d) One of the responders should proceed to the front gate with a gate card to allow emergency vehicles into the park, and direct them to the location of the emergency. e) Notify park owners. Ensure the park owners (Albert & Zita Crowley and family) are aware of the emergency. The seasonal residents of Dreamland Resort have donated an AED (Automated External Defibrillator). gate and turn right (west) on the first cross-road (not the walking trail). will sound when the AED is removed from the box. A walk-in clinic is available during limited hours in the Lansdowne Place Shopping Mall in Peterborough. It is suggested that you call before leaving for the clinic as their hours may vary due to weather, holidays, or Doctor schedules. The clinic is located upstairs in the Superstore. Enter the store via the main mall entrance. The stairs and elevator to the clinic are on your right just after entering the store. Thursday 9am - 6pm Please call before leaving. The last walk-in patients will be accepted 30 minutes to 1 hour prior to closing depending on how busy they are. Driving Directions: From the resort, turn right towards Hastings, then make the first left turn (north) on the 6th line to the next intersection at County Road 2. Turn left (west) on County Road 2 and continue west to County Road 38. Turn right (north) on County Road 38 and proceed to the lights at Hwy 7. Turn left (west) on Hwy 7. Take Hwy 7 to Peterborough. At the lights where Hwy 7 turns left, continue straight ahead. 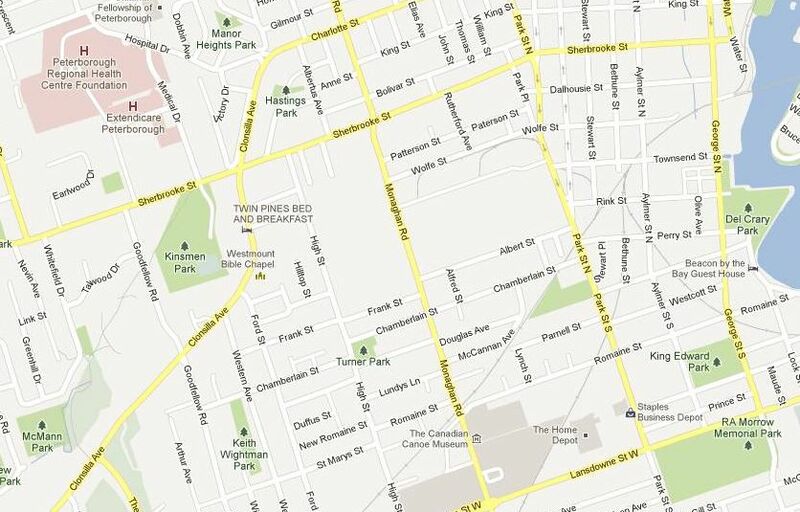 As you enter Peterborough it becomes Lansdowne Street. Continue west on Lansdowne Street. 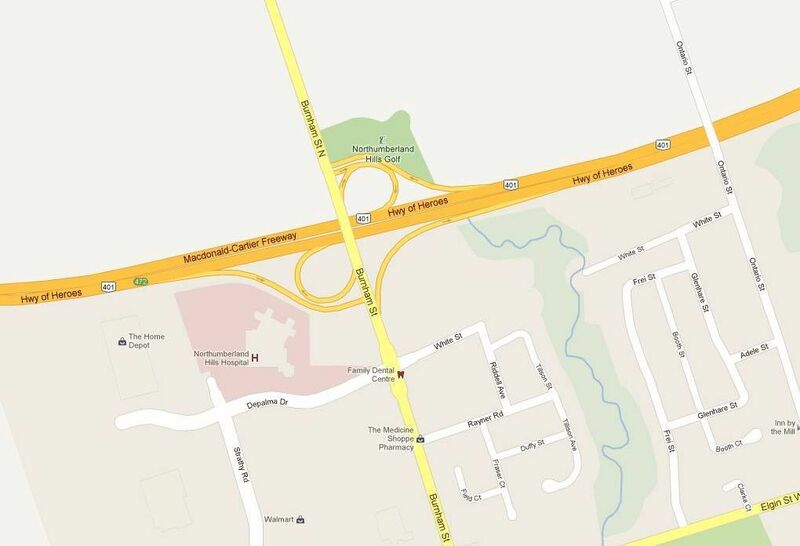 After passing the Monaghan Road intersection you will see Sears and the Lansdowne Place Mall on your left. Turn left at the next intersection (High Street). You will see the Loblaw’s Superstore straight ahead of you. The main entrance to the Superstore is at the left end via a mall entrance. There are now at least three Telemedicine clinics in this area. This is a new concept. With a nurse present, you will consult with a doctor via video link. Please follow this link to the Ontario Telemedicine brochure for a description of services provided. Follow this link to the Inside Belleville newspaper for more information. Clinic Hours: Monday - Friday Variable Hours Please call before leaving. There are two 'Good Doctors Medical Clinics' in this area Call before leaving to confirm they are open. There are three hospital emergency departments in this area. A major regional hospital is located in Peterborough, with smaller hospitals available in Campbellford and Cobourg. Hospitals are listed by driving distance from Dreamland Resort. Driving Directions: From the resort, turn right towards Hastings and continue east along River Road and Front Street to the lights in Hastings. At the lights, turn right on Bridge Street (Hwy 45). Drive south on Bridge Street. Just past the two gas stations, turn left (south) on Route 25. Continue south on Route 25 to the intersection of Route 35. Turn left on Route 35 and continue east to the T Junction at Hwy 30. Turn right on Hwy 30 and continue into Campbellford on Bridge Street. At the lights, proceed straight ahead on Bridge Street over the bridge into downtown Campbellford. 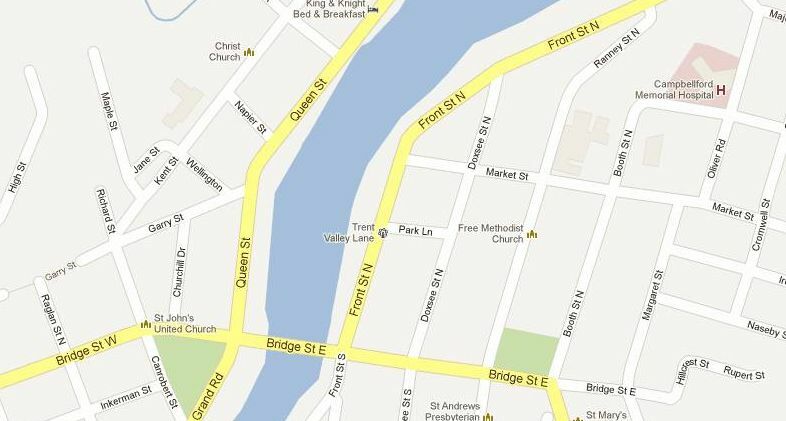 Go through downtown Campbellford and past the park on the left, then make a left turn on Booth Street North. Continue along Booth Street North to the hospital. Driving Directions: From the resort, turn right towards Hastings and continue east along River Road and Front Street to the lights in Hastings. At the lights, turn right on Bridge Street (Hwy 45). Continue south on Hwy 45 to Hwy 401. Drive west on Hwy 401 (towards Toronto) to the next exit. Take Exit # 472 south onto Burnham Street. Turn west onto DePalma Drive. 705-748-8599 and leave a message for a call-back. During business hours, you will probably receive a return call from a dentist within an hour. Do your children know your site number? Surprisingly, they probably don't. Please make sure your children know your site number so that if they have a problem we can find you easily. Parents are reminded that they are responsible for their children at all times. Playgrounds are not monitored and lifeguards are not posted at the pool or waterfront. This web page provides an overview of the emergency procedures used within Dreamland Resort, and information regarding walk-in clinics and hospital locations in the area.